On the night of 17th February 2010, my family and I went to Everise Supermarket at BDC to do a last minute shopping prior to CNY public holiday. 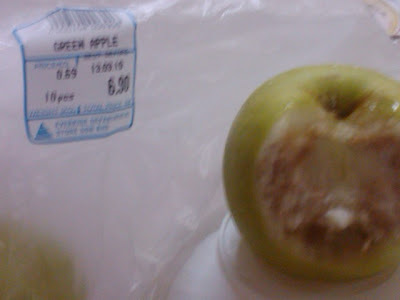 Some of the items that I bought were the two packets of green apple (my favourite fruits). Well to cut the story short, the next day, on 18th February 2010 I ate one of the apple, and to my surprised were spoiled. I then checked the rest of the apples, and out of 13 apples, only three apples were fit for consumption. 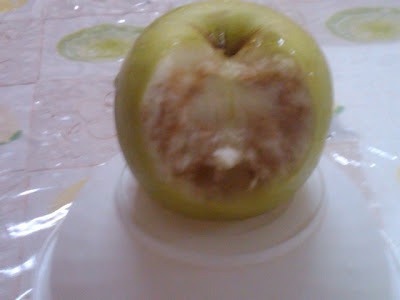 I did not return the spoiled apples to Everise Supermarket as doing so will cost me more. 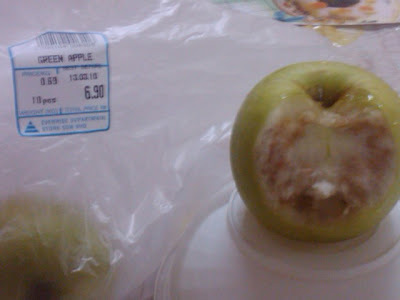 But for record purposes, I took the pictures of one of the spoiled apples for the visitors of this weblog and also for the government responsible to take action against this supermarket. I just wonder, how could such a big supermarket like EVERISE willing to sell such a spoiled fruits to it customers.